[SatNews] Showing for the first time at IBC at Stand 1.A49, Newtec's DualFlow is a new technology allowing broadcasters to migrate cost-effectively from traditional ASI to IP-based satellite operation, with efficient investment during the transition period. Aimed at the contribution, DSNG, and distribution markets, DualFlow enables two-way IP interactivity over satellite and allows operators to choose when they make the switch to IP by simultaneously supporting both ASI and IP. Operators can, therefore, continue to service clients using ASI and cater for clients already converted to IP operation. DualFlow is available as part of Newtec's Azimuth satellite broadcasting modulation equipment. More information about DualFlow is available at http://www.newtec.eu/DualFlow. Also being demo'd is Newtec's FlexACM, a unique end-to-end solution that combines a range of cutting edge technologies for implementing ACM technology, IP shaping, compression, and acceleration in a very efficient way for IP trunking and IP backbone satellite links. The implementation of FlexACM can result in a doubling of the data throughput in a given satellite segment while also guaranteeing 100 percent link availability and reducing OPEX by up to 50 percent. 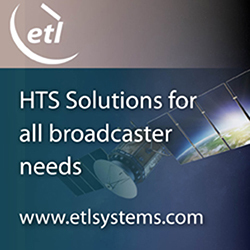 FlexACM is available as part of Newtec's Elevation product family, which consists of DVB-S2 IP satellite modulators, demodulators, modems, and satellite IP appliances. More information about FlexACM is available at http://www.newtec.eu/FlexACM. Also during IBC2010, the company will release version 8 for the Azimuth and Elevation product lines. The most recent version features numerous hardware and software advances for both product families. Sat3Play, which will also be on display, is an affordable two-way satellite broadband system designed for IP-based service providers such as ISPs wanting to offer competitive voice, data, and television services in areas where no terrestrial broadband connection is available. Offering significant cost of ownership reductions through consumer self-installation, ACM terminals, and a flexible migration path from Ku- to Ka-band, Sat3Play is a highly effective end-to-end solution. More information about Sat3Play is available at http://www.newtec.eu/sat3play. Another system being demo'd is MENOS, an award-winning networking system used to exchange multimedia content over satellite. Aimed at professional broadcast applications, MENOS allows operators to share video and audio material among several sites scattered across a large geographical area. Proven in operation by ASBU/Arabsat, MENOS incorporates the fastest and most cost-effective technologies for media exchange, with a complete range of tools to facilitate the coordination and communication between personnel across the network. Investment costs in DSNGs can be shared by using the OpenDSNG platform, allowing broadcasters to equip and use a DSNG on both the MENOS network and existing legacy TV contribution networks. 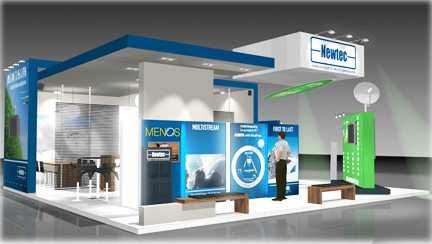 More information about MENOS is available at http://www.newtec.eu/menos.